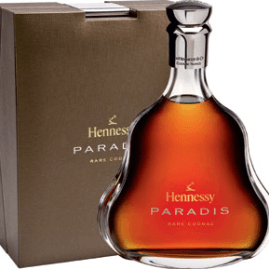 Hennessy Cognac Paradis Brandy gift box. A gourmet blend exists, revealing the successive aromas that great cognac can obtain, it is called Paradis. Paradis opens the gates of a refined, unique and elegant dimension. Paradis reveals its delicate and velvety character, hinting at the silky texture that will follow. Then floral notes of jasmine and honeysuckle burst forth, underlined by a layer of soft red berry intensity. Paradoxically, suggestions of spicy notes rise then vanish, leaving richness on the palate. The Hennessy Paradis is an invitation to a warm, timeless moment. The feelings it inspires arouse the senses of everyone who tastes it.